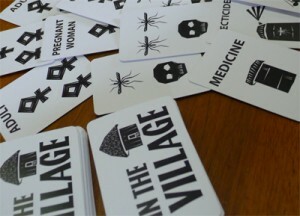 In the card game In the Village, players must cooperate and use limited resources to ensure their survival against the threat of malaria. 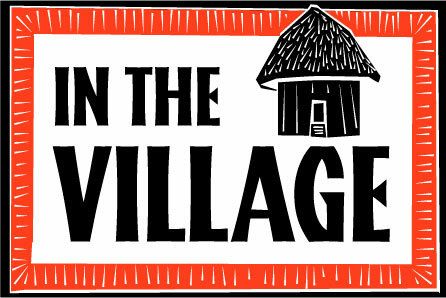 In the Village was originally designed as a challenge: Could a game demonstrate to players the basic ideas behind malaria prevention, and foster a reliance on community-based health care solutions? The game is designed for five players (or, in smaller groups, one player may take on more than one character). Each player tries to keep his or her character(s) alive through nights of mosquito attacks, with the caveat that if even one player dies, the game is over. While the game’s five players are given the agency to act as individuals, the victory and loss conditions apply to all players equally, suggesting open and selfless cooperation as the optimal strategy. Despite this, playtesting found that many players would guard their own resources and try to protect their perceived individual interests. Winning the game requires overcoming this instinct towards selfishness. Players end up sharing resources to make sure the group survives. The game offers a compelling model for community caregiving while offering fun, engaging gameplay.